Unusual for Japanese auto manufacturers, Honda has let it be known that it will launch an ambitious and exciting midship-engined sports car of very high performance in about a year's time. The early release of general specifications and the showing of a prototype car at two auto shows, Chicago and Geneva, as well as a private press meeting in Tokyo, enable Honda's R&D group to carry on final development and evaluation works in the "natural" environment, the public road. This was done in Europe as well as in America, the latter the car's primary market, without worrying about and evading spy-photographers, explains a senior Honda engineer. sports car slated for market debut in early 1990. Unique for the NS-X, obviously a temporary designation given to the car, is its all-aluminum chassis-body construction to attain light weight, which is 1300 kg for the prototype, with an overall length of 4315 mm, width of 1800 mm, and height 1170 mm, riding on a 2500-mm wheelbase. The chassis is a welded aluminum monocoque structure, much like a steel-integrated chassis-body unit, onto which largely aluminum (front and rear facia/bumper panels are resilient plastics) outer panels are attached. It is straightforward welding. Honda has gone to lengths for some years to develop specific welding technology for series production, including special spot welding nuggets. It is also speculated from the solo prototype that the car's heftiest frame members are of extruded aluminum tubing which should be joined by seam welding, of which the company should possess a sufficient accumulation of know-how and experience from its motorcycle production. The car's suspension, by unequal length upper and lower arms fore and aft, is also all aluminum. Light alloy is extensively used in the engine, except the "steel crankshaft," quips President Nobuhiko Kawamoto of Honda R&D. It is a three-liter version of Honda's naturally aspirated and fuel-injected V6, that features four-valves-per-cylinder heads. It is hinted that it still employs a single overhead camshaft per bank, operating valves via rockers and short overhead pushrods as in the Legend cars; however, twin overhead camshafts per bank and Honda's variable valve timing and lift mechanism (AE Jan. '89) are considered. In its present tune, the engine produces over 187 bkW, propelling the car to velocities over 250 km/h, and shortening a standing quarter-mile distance acceleration to under 14 seconds. 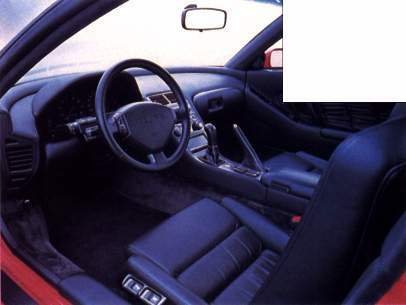 Well-equipped interior of the NX-S. Among other features of the NS-X are four-wheel anti-locking brakes, electronic traction control system, and airbags. 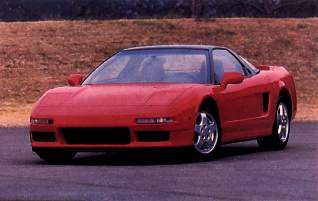 Honda plans to introduce the car in spring of 1990, with an initial annual production of 5000 units.